If September's High Score board was an escalation on August's Scoreboard, then the same can be said for October to September! The Highest Score for October belongs to first-time winners at Hitch, and second time competitors, the West Virginia Losers Club. In so few nights of Trivia Club however, they have already cemented themselves as an all-time high scoring squad with the Highest Score in the history of Trivia Club on the east-end of Toronto with 234.5 points on October 30th! Not only that, but they came within half a point of the all-time high score established by the Electric Mayhem in February of 2016. Only one day later, the first day in November that high water mark would change... but that's next month's Scoreboard. 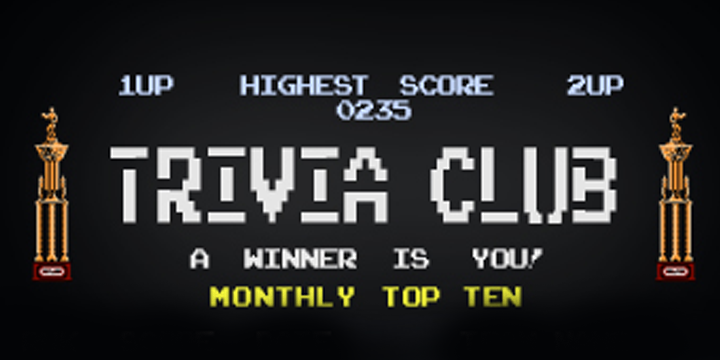 The Cunning Stunts have the highest score at Cardinal Rule for October, with 207 points at our 500th edition of Trivia Club overall! The highest score from a team who did not win the Golden VHS on the night, belongs to the runners-up on that 500th edition of Trivia Club, the Electric Bastards. The Electric Bastards, on top of being one of the THREE 200+ point teams of the month, are one of four runners-up on this month's Top Ten Scoreboard, which also includes the third place team for the second last Trivia Club event of October. The Rec Room high score was attained by Team Name with 149 points on October 10th, 2017. 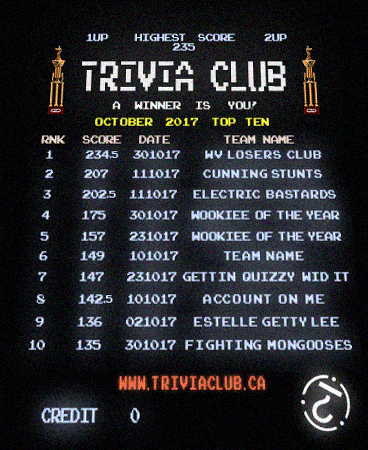 Wookiee of the Year are the only team to appear twice on the October Scoreboard, and actually have a runner-up score eighteen points higher then their Golden VHS winning score from the week before. Six of the October Top Ten high scores took place at Hitch, with five scores taking place across two events at our Home Away. Two of the other high scores took place at Cardinal Rule, with the other two taking place at The Rec Room, with each pair including the winners and runners-up of a specific event. David Bowie's Corporate Whores see their six consecutive appearance streak broken, while the Cunning Stunts are making their fifth consecutive appearance on the Monthly Scoreboards. Last Place Team once again notched the 13th highest score of the month, just as they did in September. The eleventh highest score of the month belongs to Better Late Than... our first Golden VHS Champs at Cardinal Rule for October, scored 123 points on October 4th. The Mean Team for October, the high score closest to the scoreboard average, are Wookiee of the Year!